Mossdale. For twenty years the mere mention of the word was enough to make the potholer shudder with horror and order another pint. It raised visions of endless jagged crawls, icy canals, froth-coated sumps. Half the time the entrance was under water. The other half it was blocked. It was the most arduous cave in Britain, demanding almost superhuman endurance, while the water rose 700 feet below, making it potentially the deepest cave in Britain. The legend derived not only from the cave but also from its discoverer, R.D. Leakey. Leakey possessed qualities of physical strength, resistance to cold and willpower that made him quite outstanding. Much of his exploration in Mossdale was solo for the reason that few of his contemporaries approached him in physical endurance. As time went on the difficulties of the cave and Leakey's phenomenal performances grew more and more closely linked and the legend was born. And even Leakey had only reached the end of the cave once. Mossdale Beck rises on the southern flanks of Great Whernside above the 2,000 foot contour. It flows south, parallel to Wharfedale for approximately four miles before sinking at Mossdale Scar as probably the largest high-level sink in Yorkshire. Its valley is wild, grim, dark. The scar is an inset of elephant grey limestone on the slopes of Black Edge. Well over one hundred feet long and up to fifty feet high, the rock is shattered by frost and flood and every winter sees a new section of the face peel away to litter the scar foot with sharp-edged blocks. The stream runs over a shingle embankment beneath the scar and disappears into a deep pool hollowed out of mud and boulders. The site of the sink changes from year to year and in times of flood a broad torrent roars underground the whole length of the scar. Below the sink the valley broadens and a large stream flows down the far fell to cross the valley floor and sink in a series of muddy depressions. It is not met in Mossdale Caverns and may enter an unknown system. In the middle course of the stream is Swarthgill Hole, 2,000 feet of sharp wet passages. By the track is Swarthgill Level, a disused lead mine now beautifully decorated with colourful calcite formations. Further down, the valley acquires another stream which sinks above Gill House Farm. Below the farm is Gill House Pot, a fifty-foot shaft which appeared one night just after the war. Lower still, the valley broadens out onto Grassington Moor, with its old shafts, disused chimneys, and dams. Lead, zinc and calamine were mined here. Now the last smelting house at Yarnbury has been closed. In the summer of 1940 Bob Leakey and his friends were trying all the lead-mine shafts they could find on Grassington Moor. This was at the urging of Eli Simpson, who had unearthed a reference to a lost cavern found by the old miners. Leakey's band descended many a crumbling shaft, but without success; the lost cavern remained lost. One day by way of a change the party wandered up to Mossdale Scar. They poked about in the crevices at the foot of the scar but there seemed to be no way in. Then Bob dropped his pipe into a crack. He started to pull out boulders and soon had retrieved his pipe and also found an inviting hole. Dropping into it, he found a U-bend mostly full of very cold water-The Lavatory Basin. Beyond, a way through loose boulders led towards the sound of the stream. In the weeks that followed the three girls in his party were induced to brave the horrors of the Basin. The party explored as far as Assembly Hall, a large flat-roofed cavern where they met the beck, then downstream to a wide pool of peaty water. Bob plunged through the sump and by kicking out boulders and gravel holding back the water, managed to create an airspace all the way through. The ladies were tied onto a length of rope and pulled through, while Ken Gray held the other end. More river cave led to the second Drown or Glory, dealt with in a similar way. The explorers found a magnificent stretch of river cave leading to three more intricate ways forward which joined at Rough Chamber where the main stream passage seemed to end. Tucked away behind a sill of rock was the way on, a hands and knees crawl which quickly earned the name of Rough Passage. On a later trip Bob, Ken, and others pushed on past Kneewrecker Junction, 600 feet from the start of Rough Passage. Jean Wright, one of Bob's climbing companions was sent down the then unexplored Near Marathon Passage. Bob's party returned from the mighty caverns of Kneewrecker Series to find no sign of Jean. Setting off down the crawl Bob found her well down Near Marathon, stuck. After a great deal of manoeuvring, he managed to pass her and help her turn round. Then the long crawl out began, with Jean's lower attire somewhat lacking. After this episode Bob pushed Marathon on his own and on his next visit explored to the bitter end, entering the large caves beyond. Dog-tired after a day's work and the drive up from Manchester he did not explore the streamway but climbed up into the High Level Mud Caverns, covered himself with sand and went to sleep. He awoke to find he had left his torch on and the batteries were flat. Getting his only spares out, he left in some haste. After this venture, Eli Simpson became convinced that this was the master system in Yorkshire and recruited Lewis Railton for a second expedition. Lewis and Bob explored to the boulder choke terminating Stream End Caverns and surveyed back to the end of Far Marathon. After this trip enthusiasm waned. A large inlet entering Stream End Caverns remained unexplored, as did the northerly branch of the High Level Mud Caverns. The southern branch of the Caverns was explored for 600 feet or so on Bob's first visit but continued beyond this point. In the early summer of 1960 I was working at Threshfield Quarry near Grassington. 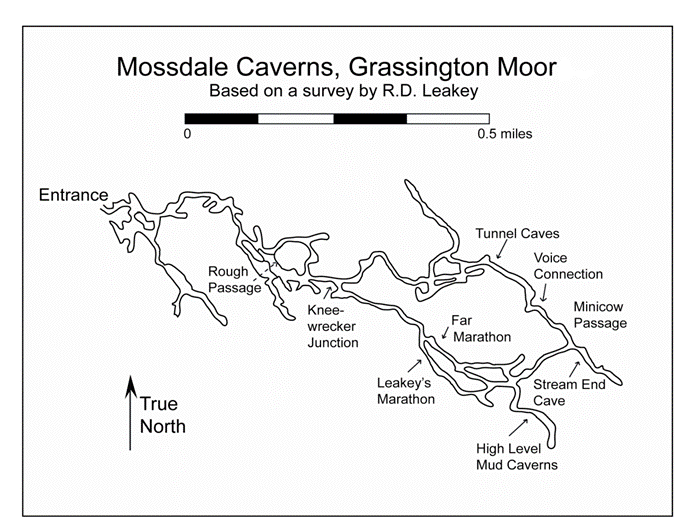 The quarrymen took a great interest in the local caves and I learned that some of the Leeds University lads would be down Mossdale one weekend. On a beautiful June evening I walked up to the Scar where I found a couple of the Leeds cavers pitching camp. On Sunday they were surveying in Kneewrecker and Marathon as part of a project to map the whole cavern accurately. At the pub in Grassington I met the rest of the party, including Barry Greenwood and Malcolm Budd, and on Friday night, I took my tent up to the Scar. Barry said we should go down on Saturday evening. We were cooking before the trip when two strangers walked into camp. One was heavily-built and soft-spoken, his rimless spectacles giving him a faint air of Billy Bunter. By contrast, his companion was a small, frail looking lad of seventeen or so. The pair were Ken Pearce, one of the explorers of Giant's Hole in Derbyshire and a man with a big reputation in caving, and Bobby Toogood his apprentice. Ken said they would prefer to come in with us and asked if the trip could be postponed to the early hours to allow them a few hours sleep. At about 2 a.m. they appeared again and I decided to join them rather than join the survey party. Ken was keen to visit Kneewrecker in search of a mysterious hole which Bob Leakey had told him about. In the floor of one of the passages, there was apparently an opening at the bottom of which a powerful stream could be seen. Leakey, on his own and without a rope, had not gone down when he first found it and had never returned to the spot. In the first light of dawn, we slid into a shadowy opening at the upstream end of the Scar. A series of indefinite gaps between black boulders led downwards; every crack and crevice was filled with tussocks and peat-sods washed in by floods. The cave was a mass of razor-edged blocks through which we dropped steeply following a ragged telephone wire. After ten minutes we reached more solid going, massive benches of rock twenty or thirty feet broad. Some complex route-finding brought us to a wide flat-roofed cavern with a large clear stream, Assembly Hall. An hour or so from the entrance we came to a fair-sized opening above the stream, Rough Chamber. We left the stream and dropped into a low shingle-floored passage at the back of the chamber. This was Rough Passage, the same size and shape as a large dog kennel and 600 feet long. It was exactly the right size for hands and knees crawling and we rattled along at a good pace. 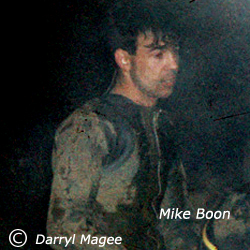 At one point was a jammed boulder which we had to squeeze under, followed by a crawl on one side in a wet tunnel. This broke into the side of a wider passage with a stream dropping over a ragged fall into an attractive black pool. The stream ran down a gentle incline of peat-stained sandstone in which it had worn perfectly smooth channels a few inches deep. This going, the greater part of the oddly named Rough Passage, runs for several hundred feet. Here the cave stream has cut down to the layer of Dirt Pot Grit underlying one of the beds of limestone and this has halted its vertical penetration. Although the passage was generally dark, a film of water on walls and floor picked up our lights and made progress quite cheerful. Nowhere could we rise from our hands and knees. At Kneewrecker Junction, where Near Marathon Passage forks off to the right, we continued with the stream down Kneewrecker Passage. Packed nose to tail we crawled on, the rear of the man in front and the rising steam making it impossible to see ahead. You took the obstacles as they came, a tight drag on one side through a diminutive fissure, hands and knees work over an armoury of rock spikes, a series of right angle bends where you could half stoop for a few feet. In half an hour we reached the main passage of Kneewrecker, a flat-roofed cavern floored with black boulders. Here we left the surveyors and began our search for the mysterious hole in the floor. Downstream, to the right, took us past several junctions with choked passages until the passage enlarged and a wall of rock abruptly blocked the way ahead. This was Four Ways Chamber, where four passages met. We found a small hole in the base of the wall ahead and were soon crawling downstream in a passage similar to Kneewrecker. The rock was solid, the stream clear and merry, altogether an attractive passage. After 600 feet of crawling the passage grew suddenly tight just before a pool of water which curved out of sight. I tried to get through without success; shouting gave back a chill watery echo indicating the passage sumped. Ken was not satisfied. With the air of a conjuror producing a rabbit from a hat he instructed Bobby to crawl in. But Bobby kicked and struggled in vain; it was too tight. At Four Ways once more we tried the right hand passage looking downstream. It climbed steeply and then shot straight up as a muddy rift. At the top, we found a large gloomy cavern floored with grey peat mud and boulders. It closed to the left but to the right Ken followed it to a pitch into the stream passage below. I followed a small passage on one side to a similar connection and the Leeds lads surveying below were surprised to see lights sprouting out of the roof. We returned to Four Ways and took the passage opposite, the last way out. A large round roofed passage led upwards then turned sharp right. We clambered along a rift cut deep in the passage before the cave bore left as a series of mud-cemented boulder slopes. We carried on for hundreds of feet, sometimes stooping, sometimes crawling; the passage seemed endless. Then I heard running water ahead. The others were sceptical at first but within a few yards there was no doubt. We raced on and soon reached the head of a tight drop emitting the sound of water. Hastily stuffing a ladder into it I tried to climb down but it was hopelessly tight. I tried another much larger gap but again couldn't get through. Ken said one word: "Bobby!"